Say "I Do" in the Philippines! With our 7,107 Islands there are countless reasons why you should get married in the Philippines. Let us share you a few. 1. Fantastic Wedding Destinations. From century old churches, posh gardens, world class mountain venues and of course our finest beaches-choices are unlimited. 3. Incredible Hospitality - Filipinos are the most hospitable in the world, making you feel at home in every way. 4. World Class Service - Filipino Wedding professionals are one of the best in the world. They are very hard working and creative, you could be assured that your dream wedding is in good hands. 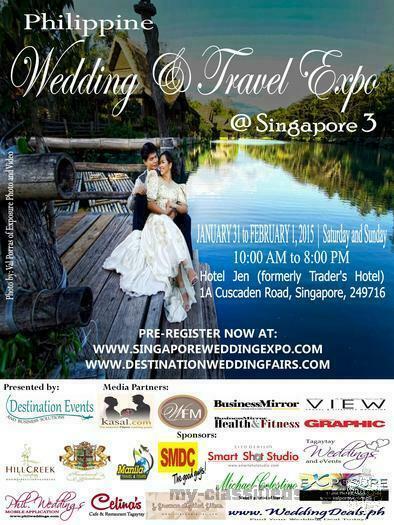 Find out more on the Biggest Philippine Wedding Expo in Singapore this coming January 31 to February 1, 2015 at Hotel Jen (Formerly Traders Hotel) 1A Cuscaden Road, Singapore, 249716, Singapore.